Many, many happy returns of to-day, my own precious, darling Mother. 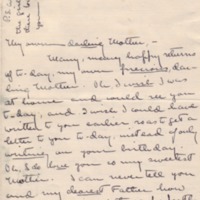 Oh, I wish I was at home and could see you to-day, and I wish I could have written to you earlier so as to get a letter to you to-day, instead of only writing on your birthday. Oh, I do love you so my sweetest Mother. I can never tell you and my dearest Father how much I think of those perfectly beautiful presents. It is simply too lovely of you all to give them to me, and I'm not even going to graduate from this little school. Oh you all are too good to me and I don't deserve it one bit. Thank-you oh so much, I can never tell you how much. The pendant and chain are exquisite and the scarf - oh my I haven't got any more adjectives that are suitable to express my feelings. Tell Tant chen that the fan is a little beauty and thank her so much for me. I am going to write to her just as soon as I get a minute. Just think it's less than two weeks now; I can hardly believe it. I feel now as if I can hardly wait to see you all again. And won't if it be fine to think that it's the last time any of us will have to leave for so long a time. Think of a whole winter with all of us there together! And now, about the debate. I suppose it isn't possible to have two daughters get great honours and win debates at once, so I have been beaten. It came off last Wednesday night - day before yesterday - and they beat us, not by their regular debates I am glad to say because every one says it was even then, but by their last retort. Julia made a splendid answer, I think, and really won the debate. I didn't mind so terribly much after the first disappointment, but what hurts me is that everyone knows that Lee did more than Davis and we didn't have the sense to prove it. I know that I oughtn't to tell even you all, because I think it's very poor spirit, but I don't want you to think that we were beaten all to pieces when we had so much the strongest side, so I don't think it will matter if I tell you what has comforted us very much since we heard it. The decision of the judges was not unanimous (one of them was very strongly for us) and Miss Thomas, Mr Cruikshank, and Mr Stone (the history teacher) all thought that we were not beaten, and that our papers were simply unanswerable. Mr. Cruikshank got very much excited over it and says that he is going to ask the judges how they possibly came to that decision, but I hope he won't. Lots of the other teachers and of course all of the girls on our side think that we weren't beaten either. I think we were, but I just had to tell you this for my own comfort. I feel so disgraced doing this way after Jessie has covered herself with such glory! But it can't be helped. I am so relieved because it is over with and I have had three free days with out a thing to do. Examinations begin on Tuesday and by Friday I will be all through for good and won't have a thing to do, unless I fail one of them, until Commencement really begins. I am not dreading any of them very much, except English, but I am crazy to get a high mark on that and I'm afraid I won't. We have the Baccalaureate sermon on Sunday, of course, and then some entertainment Monday night, but Commencement doesn't really begin until Tuesday, which is class day. Graduation exercises are at 10.30 on Thursday the twenty eighth, and we leave here at about two o'clock Thursday night. Oh, I get so excited whenever I think about it!!! But you see I promised to spend Sunday with Helen in Portsmouth and so if I leave by boat Sunday night I will get to Baltimore early in the morning. I hope Jetty won't mind if I don't get there till then. I wish I could but I didn't know that the Baltimore Commencement began so soon, and Helen says that I simply can't break my promise to her. I suppose I will only miss the Baccalaureate any way. I didn't know how very much I was going to mind leaving ST. Mary's but it is going to be simply dreadful. I can't bear to think of going away and never seeing any of the girls anymore, or at least never seeing most of them, because I live so very far away. But I won't think about it now. I think it is splendid about Father's going abroad. I am so glad and I know it will be such fun for him and will do him so much good. I only wish that you could go with him, dearest Mother. We could take care of ourselves or get Aunt Annie or somebody to take care of us. I wish you would. It will be fun to go to Lyme and stay at Miss Griswolds and I know I will enjoy more than any thing else painting with you, but I'll be scared because I can't paint to save my life. But won't it be fun for you and Jessie and I to all paint together!. . . . . . I couldn't finish this after all and so I won't even have written on your birthday. It seems to me that I always take three or four days to write a letter. The riding skirt came yesterday and I am so pleased over it. You all don't mind then if I do ride astride? I have always been crazy to try it. It certainly is a pretty skirt and thank-you oh so, so much for you it. How did you happen to be able to buy it ready made. It was such a surprise. I must hurry and finish this quick so as to get it off on the Sunday afternoon mail at least. McAdoo, Eleanor Wilson, 1889-1967, “Eleanor Randolph Wilson McAdoo to Ellen Axson Wilson,” 1908 May 10, WWP19556, Eleanor Wilson McAdoo Collection at the University of California-Santa Barbara, Woodrow Wilson Presidential Library & Museum, Staunton, Virginia.